This is my first presentation to this forum, so by way of introduction, let me explain that I’m interested in the power that video (or computer) games have, to tell stories in virtual (though ever more realistic) spaces. I want to explore what we can learn from games, as interpreters and storytellers of cultural heritage about telling emotionally engaging stories in the spaces that we look after. First, I looked at the game mechanics that appear to drive emotional engagement with video games, and I was able to find a good deal of agreement in the literature, and at the same time group them into eight categories. Some of which – spectacle, learning, society and presence for example – cultural heritage sites can easily claim to share. Others, like acquisition, challenge, music and character aren’t things that cultural heritage does particularly well. But the most obvious similarity between cultural heritage sites and a great many of the most acclaimed computer games is the way that both gamers and visitors explore a narrative by moving through space. So recently I’ve been looking at cultural heritage interpretation projects that don’t just borrow ideas from game mechanics, but actually put a game on site that requires visitors move from space to space to play it and uncover the story. For example, this is Ghosts in the Garden, designed by a company called Splash and Ripple for the Holburne Museum, Bath. It’s a sort of aural choose-your own-adventure game which encourages visitors to explore the early 19th century pleasure gardens around the museum. And on a larger scale, this is Magic in Modern London, designed by Amblr for the Welcome Trust. It’s a sort of scavenger hunt. 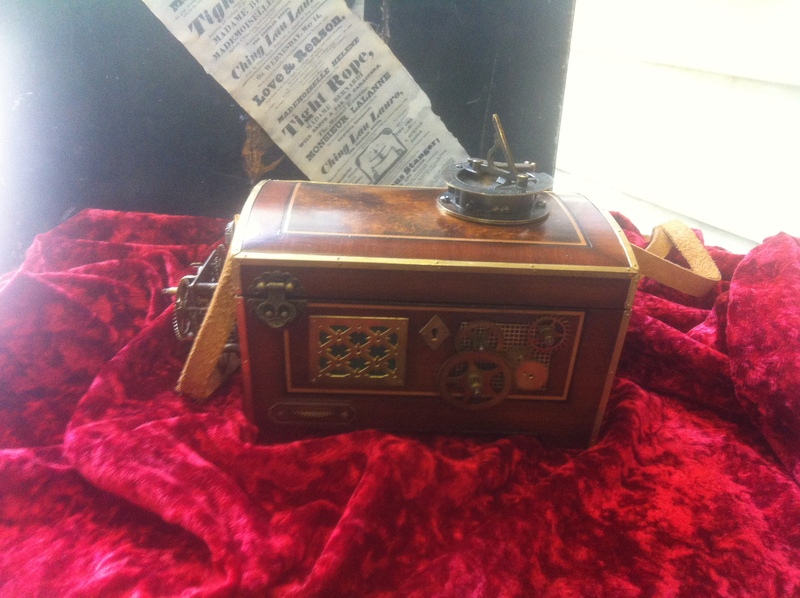 The user visits locations to collect virtual amulets and so uncovers the story of Edwardian folkloreist Edward Lovett. Southampton University, working with external partners, recently sought funding to build a similar location based game, exploring the events of the Southampton plot. We wanted to build an open source, non-proprietary framework, not just for this game, but to enable other cultural institutions to create their own games at minimal cost. This specific bit of research, sought to discover what game mechanics might best encourage gamers onto the street of Southampton, what social networks might best be leveraged, and also could we challenge gamers with something more sophisticated than a scavenger hunt. Let me make clear early on, our funding bid was not successful. I composed an on-line survey, which we distributed via the partners’ social networks, on-line gaming forums, Eatleigh’s youth network, local schools and Winchester School of art. 226 people responded, though 33 didn’t answer all the questions. Our primary challenge became apparent with the very first question block. We asked about the respondents’ knowledge of a variety of games, on fixed devices (consoles and computers) as well mobile devices. Mobile games have an awareness issue. Eleven people had never heard of Minecraft. 178 people haven’t heard of Ingress, a location based game that according to some sites, including Android Headlines on 4th December 2012, is “taking the world by storm.” Just 32 people said they’ve played a game that uses their device’s location. With its open world, layers of (made up) history, and research quests, Skyrim is close to many an archaeologist’s heart, and proved popular with our correspondents. But of course different people like different things, and so I wanted to see if they was a particular “type” of gamer who might be more attracted than others to the open and real world, location based game that we were proposing. The most famous classification of gamer motivations is Richard Bartle’s 1996 paper. However that is actually based on players of just one genre of on-line gaming, and has limited application beyond that. Hard Fun – The emotion that the team observed here was fiero, an italian word borrowed by Eckman because decribes the personal feeling of triumph over adversity, an emotion for which there is no word in English. And the game mechanics that unlock that emotion (and possibly on the way, the emotions of frustration and boredom too) are: goals; challenge; obstacles; strategy; power ups; puzzles; score and points; bonuses; levels; and, monsters. Easy Fun – Curiosity is the main emotion evident in the Easy Fun style of play, though surprise, wonder and awe were observed too. The game mechanics that define this style of play are: roleplay; exploration; experimentation; fooling around; having fun with the controls; iconic situations; ambiguity; detail; fantasy; uniqueness; “Easter Eggs”; tricks; story; and, novelty. People Fun – Happiness comes with People Fun, Lazzaro’s team observed “amusement, schadenfreude (pleasure in other people’s misfortune) and naches (pleasure in the achievements of someone you have helped)” among players in this mode. Among the he long list of game mechanics that get people there are: cooperation; competition; communication; mentoring; leading; performing; characters; personalisation; open expression; jokes; secret meanings; nurturing; endorsements; chat; and gifting. I used some of the evidence Lazarro had gathered to create a number of Likert agreement scale questions, which might, in combination, indicate respondents’ preferences for the four different types of fun. This example shows how people responded to the questions about what Lazarro called Serious Fun. And this slide shows how the combined responses to the questions indicate the cohorts’ preferences for the four types of fun. You will note that Easy Fun, which includes a preference for narrative or story based games, is the highest scoring in this sample. I was very encouraged by this. I was hoping that I’d see s correlation between a preference for Easy Fun and another Likert question we asked about interest in a locatative game. 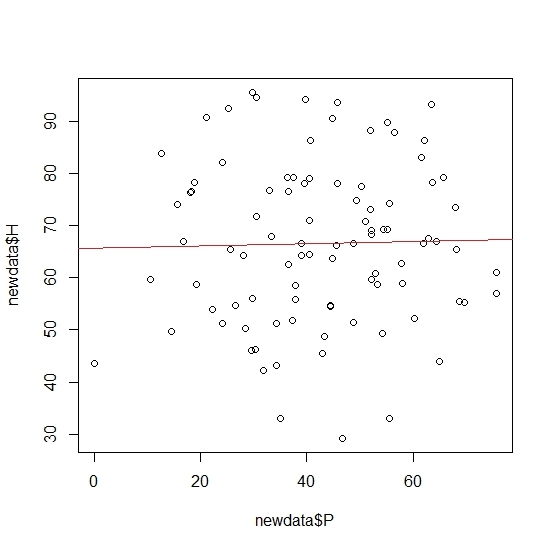 However this correlation matrix shows no relationship between respndents’ preference for Easy Fun and their expressed interest in locatative games. There is, however, a possible relationship between gamers’ preference for Hard Fun. 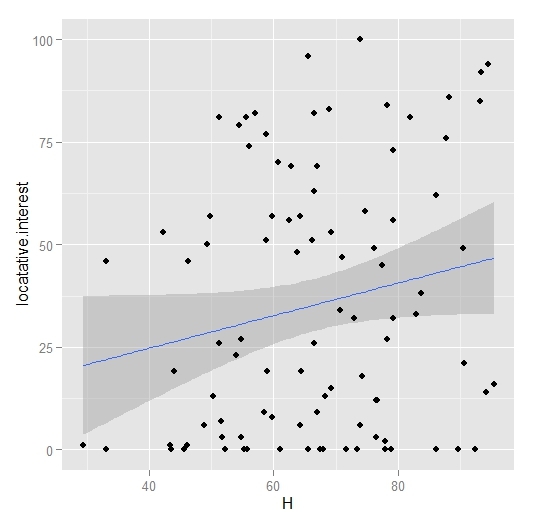 However, on closer inspection of that relationship, the confidence intervals shown in this scattergram, show me I can’t disprove the null hypothesis. Now I should state that the number of respondents who answered all the questions required for this analysis was less that half the total number of completed surveys, just 94. So it may be that a larger sample size would better enable me to prove or disprove the null hypothesis. But the more worrying observation is this one – a large proportion of this sample expressed zero interest in games involving the player’s location. Which resonates with the earlier observation that there was very little recognition or awareness of of such games. So it may be that most people don’t want to play games that use their real world position, or that idea is yet to have it’s moment. Either way it strikes me I’d be better off investigating how some of games’ engagement drivers could improve cultural heritage interpretation, rather than rushing to import locatative games wholesale into the cultural heritage space. The Serious fun preference questions thus showed the most division among gamers. What’s particularly interesting is that the lowest score in that range is zero, so at least one respondent vehemently disagreed with all the statements associated with that preference. The same is true of the People fun variable. That matrix at the top of the post suggests that despite (or because of?) 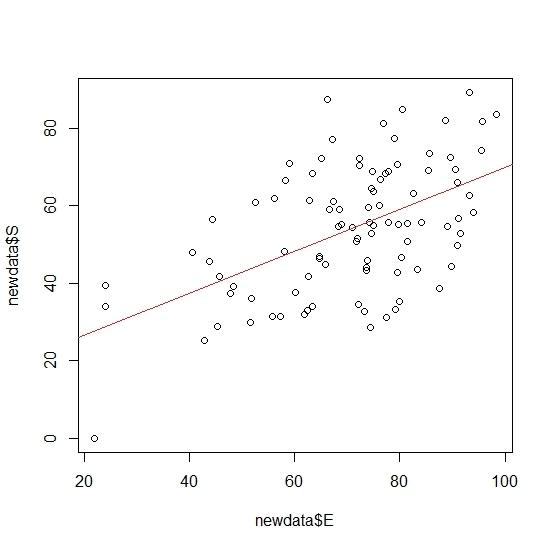 the wide range of the Serious fun variable, its one that shows some correlation with all the other variables. 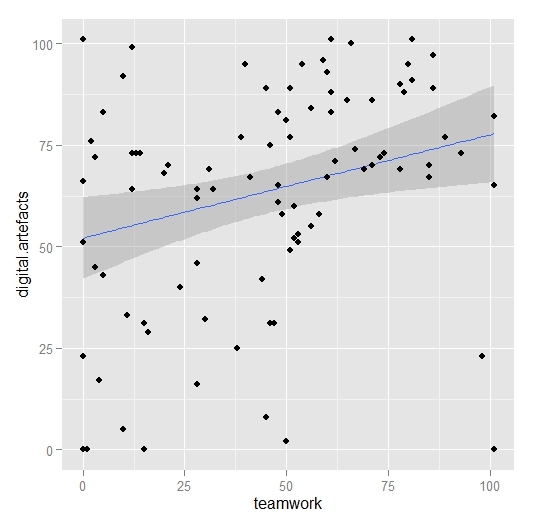 Stronger correlation, in fact, than the People fun variable, which correlates poorly with the all the variables except Serious fun. Not a bad, shall we say “moderate” relationship. For every point up the Easy fun preference scale somebody scores, they are likely to score 0.54 higher on the Serious fun scale. With a standard error of 0.09 the T value for this relationship is 5.9, and the corresponding p value is very low at 0.00000006. So this appears to be a statistically valid relationship. Hardly any relationship at all then. After last week’s hair-pulling day of frustration, I’ve made I bit more progress. 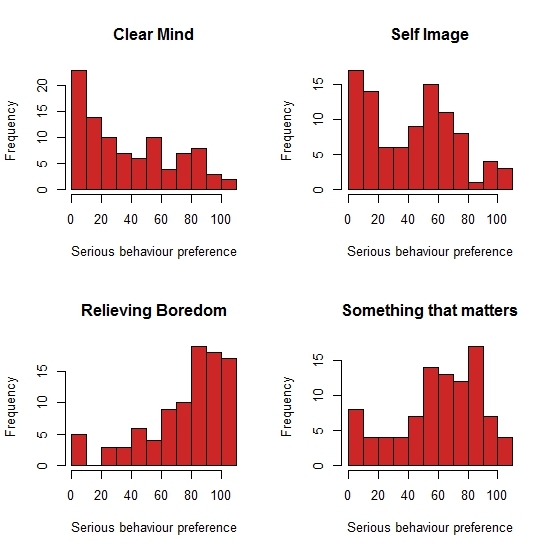 The survey contained seventeen questions which were based on the theory of four types of fun, set out by Nicole Lazzaro. These were 101 point Likert scales, wherein the participant indicated their agreement with a statement, using a slider with no scale and the slider “handle” position set randomly, to reduce systematic bias. Of course, these being Likert disagree/agree scales, I was still expecting clumping at one end or the other despite my attempts to reduce that by making them 101 point scales. And so it proved, in many cases, as these histograms of the four questions I used as indicators of a preference for “Serious Fun” show. I never intended to do any correlations with the responses to the individual questions though. Instead my plan was to average out each individual’s responses to the indicator questions to create something more like a continuous variable which I could correlate with other responses. Doing that for the responses to the Serious Fun indicator questions, for example, turns the four clumpy histograms above into something a lot more like a “normal” curve. 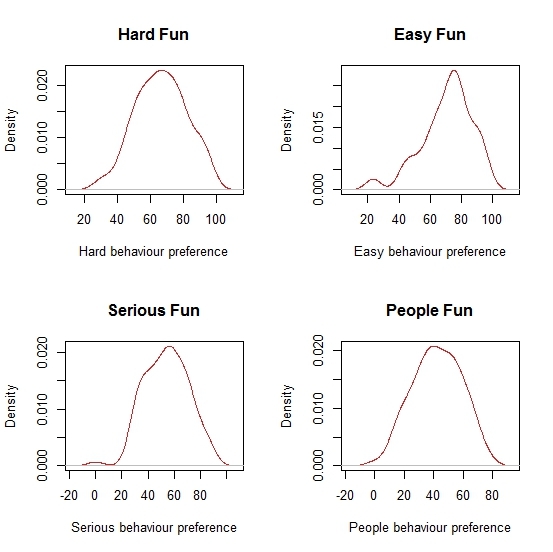 You’ll note straight away, that the “Hard Fun” curve is the one that most resembles a “normal” bell curve. Easy Fun has a distinct negative skew, and in fact all three others have a slight negative skew. 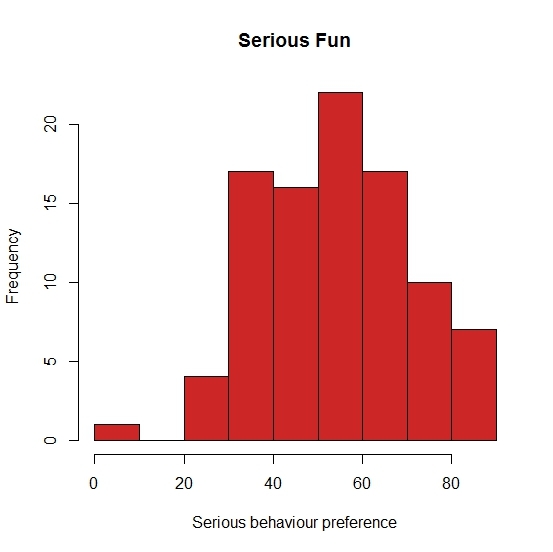 And there’s a distinct preference apparent in this sample for Hard and Easy Fun over Serious and People Fun. 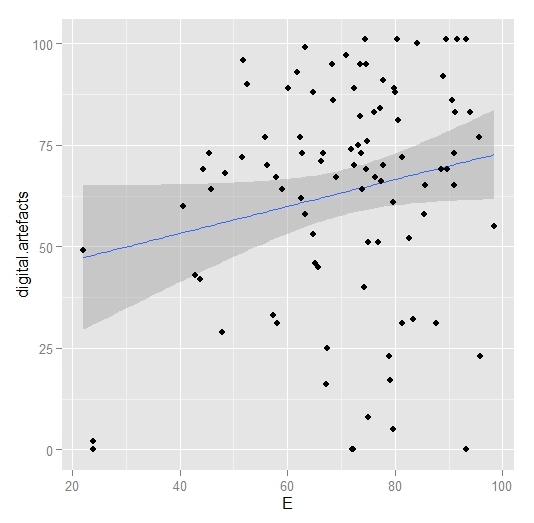 In fact, the most popular preference in this sample is for Easy Fun where the mean stands at 70.8 and the median (in this most skewed of the four distributions) at 73.7. The mean of the Hard Fun distribution is 66.61, in third place is Serious Fun with a mean of 54.06 and trailing behind is People Fun with a mean of 42.22. I was a bit surprised that People Fun scores so poorly in this sample, but I guess I shouldn’t be because one of the questions I used to indicate a preference for People Fun was “I don’t actually like playing games all that much” which I don’t suppose is going to find much agreement among gamers after all. 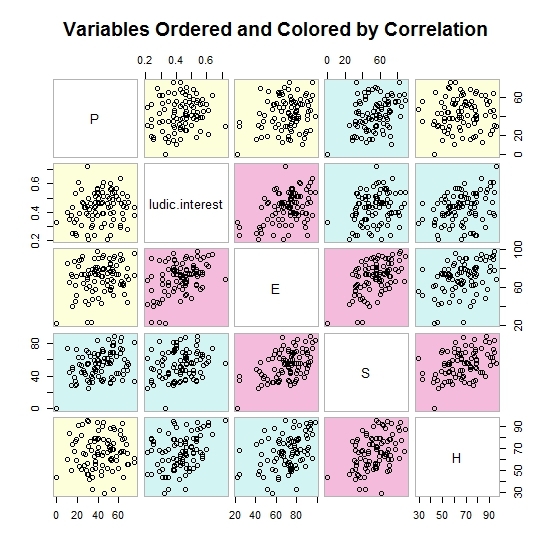 Which begs the question “would People Fun preference correlate negatively with the Ludic Interest vector I created last week?” But rather than look at that relationship on its own, lets see how all the derived variables I’ve created relate to each other. So, people fun correlates a bit with Serious Fun, but little else. 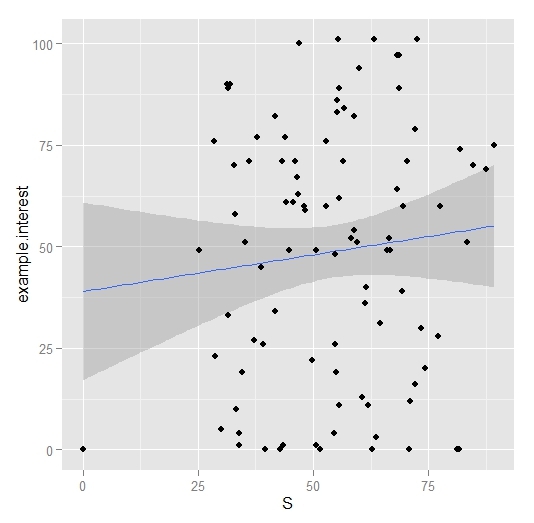 Ludic Interest correlates less well with Hard Fun than I might have expected. Though the Ludic Interest variable was admittedly an afterthought and the selection of games from which it was derived by no means scientific. I might rethink that whole section next time. 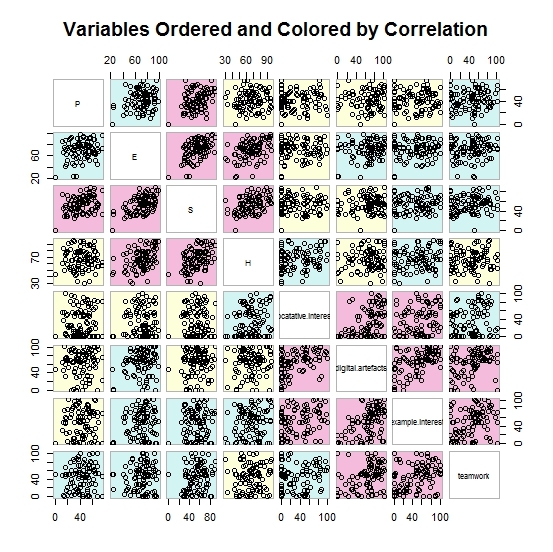 The Serious Fun vector correlates with other variable more than I expected, and the little scatter plots look interesting, so next time I’ll investigate some of these relationships more deeply. 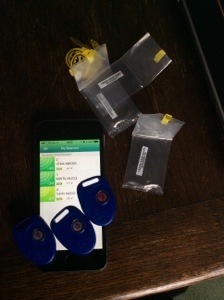 My Gimbal beacons arrived yesterday. These are three tiny Bluetooth LE devices, not much bigger than the watch battery that powers them. They do very little more than send out a little radio signal that says “I’m me!” twice a second. I’ve just tried leaving one in in each of three different rooms, then walking around the house with the the simple Gimbal manager app on my iPhone. It seems their range is about three meters, and the walls of my house cause some obstruction So with careful placing, they could tell my phone very simply which room it is in. And it could then serve me media like a simple audio tour. But the third option and the one I want to experiment with, is this. I distributed my three Gimbals around the perimeter of a single room. Then when I stood by different objects of interest in my room, read of the signal strength I was getting from each beacon. It looks like I should be able to triangulate the signal strengths to map the location of my device within the room to within about a metre, which I think is good enough to identify which object of interest I’m looking at. What I want to do is create a “simple” proof of concept program that uses the proximity of the three beacons to serve me two narratives, one about the objects I might be looking at, and a second more linear narrative which manages to adapt to the objects I’m by, and which I’ve seen. I’ve got the tech, now “all” I need to do is learn to code! Unless anybody wants to help me…?